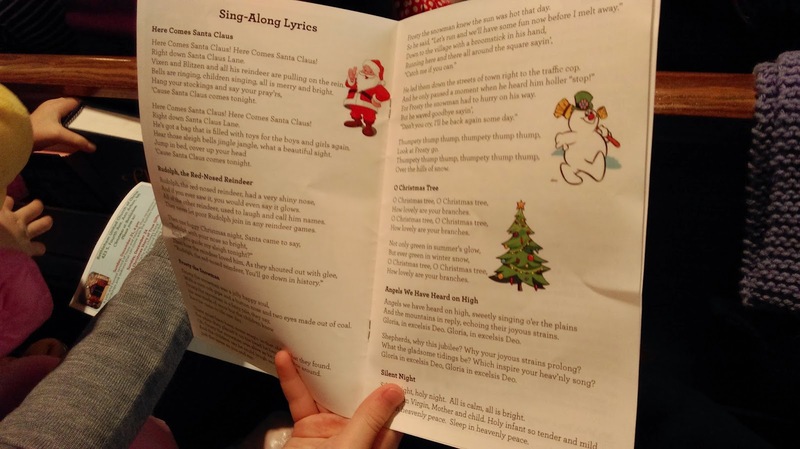 My daughters (2 and 6 years old) had a great time at last night's Sing-Along with Santa presented by the Ann Arbor Symphony Orchestra. 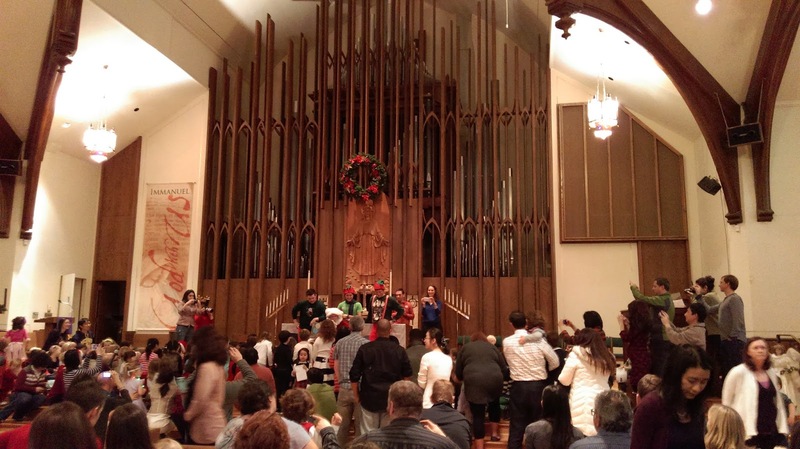 The Bethlehem United Church of Christ in Ann Arbor hosted the concert, which featured the orchestra's Becky Gawron on trumpet, piano accompaniment by Lori Zupan, and the Community High School Jazz Combo. Some of the songs from the evening. The musicians were talented, and I was very impressed with the high school jazz band, but the star of the evening was Santa (disclaimer: I know Santa personally. More on that later). Santa, aka Charley Sullivan, was full of life as he led the audience in their favorite Christmas tunes. His energy was especially impressive considering he flew in from Indonesia that morning. Santa's three elves were larger than most elves since they also are members of the University of Michigan's men's rowing team that Sullivan coaches. 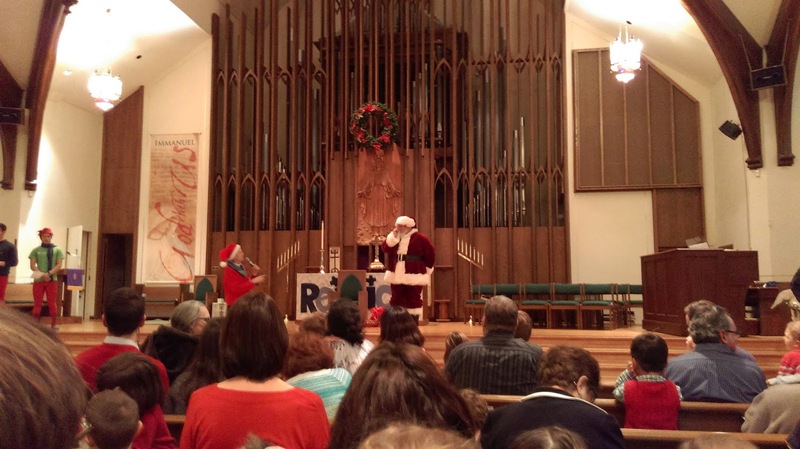 Santa and his elves sang and danced throughout the church while the children assembled sang merrily along. Eventually, some children could not contain their excitement and began dancing in the aisles too. The evening included Santa and his elves reading 'Twas the Night Before Christmas with the children gathered around them. After the reading, the conductor of the Ann Arbor Symphony, Arie Lipsky, directed the audience in a joyous rendition of the Twelve Days of Christmas. The highlight of the event for my children was meeting Santa after the show. Each child was guaranteed the chance to meet Santa with the price of admission. Sullivan grows a real beard every year to ensure that he is the most authentic Santa around. His authenticity also showed in the amount of time he spent with each child and how he gladly posed for pictures with children and their families.Since I once rowed for Sullivan at Michigan and still keep in touch, I was able to give him some inside info about my oldest daughter. She was amazed that he knew her name and details about our recent move back to Michigan. I felt a little guilty that we got a little extra attention, but because Sullivan took a lot of time with each child, I did not feel too bad. When we left the church, I asked my daughter why she thought Santa knew so much about her, and she said, "Because Santa can see you when you're sleeping and knows when you're awake." Thanks, Santa, for making her believe for at least a few more years.